Over 10,000 books were distributed to every elementary student in the Kansas City Public School District as part of an effort to promote summer reading and giving students a high-quality, age-appropriate book of their own. The effort was highlighted by large events at Garcia, Rogers and Foreign Language Academy. Learn more about the effort and the partners. At the events, KCPS school officials including KCPS Supt. R. Stephen Green and Kansas City, Mo. Mayor Sly James participated in programs and read to students. National children's author Erica Perl presented her books "Dotty" and "When Life Gives You OJ" to students at each school. The reading outreach was supported Local Investment Commission, the Kansas City Federation of Teachers and School-Related Personnel, the Kansas City Public Library, and the Kansas City Mayor’s Office and the mayor's Turn the Page KC initiative. The 10,000 books came from First Book, an award-winning nonprofit that provides children with quality new books at deeply reduced prices. The books are intended to encourage children and the families to start a personal library, read at home and read extensively. 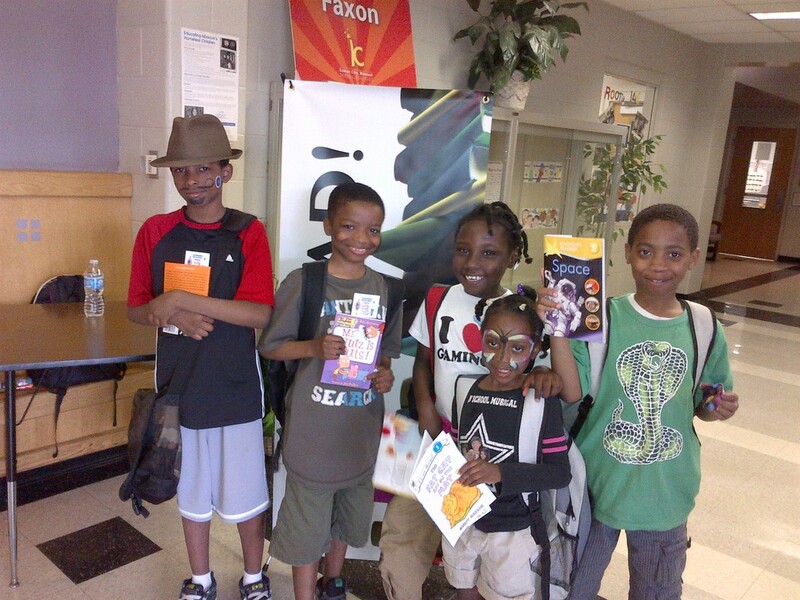 Students from Faxon Montessori with their new books.